New Vehicle Sales Top Producer For October! Bob’s unwavering commitment to excellence and to providing first-class service to his clientele showcase his professionalism, hard work and dedication. We encourage Bob’s family of clients, friends and associates to join us in congratulating Bob on his exceptional performance! Connect with Bob personally at 519-948-7800 ext. 209, via email: bmarsh@rosecityford.com or visit in person at 6333 Tecumseh Rd East off of Jefferson. Connect with Bob personally at ﻿﻿﻿﻿﻿﻿﻿519-948-7800 ext. 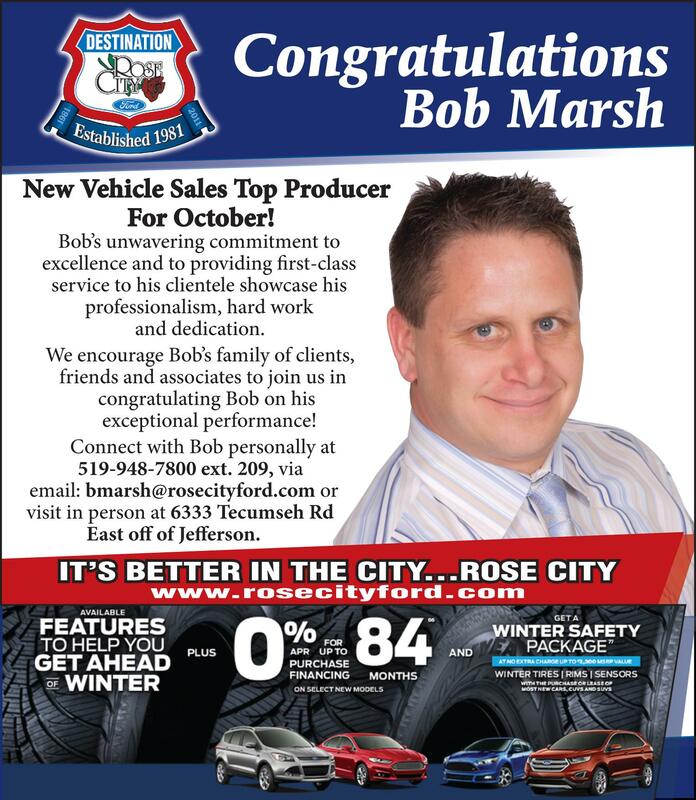 209﻿﻿﻿﻿﻿﻿﻿, via email: bmarsh@rosecityford.com or visit in person at 6333 Tecumseh Rd East off of Jefferson.